You are very welcome to join us at All Saints Church, Didcot. We have a variety of services and activities, ranging from Sunday services at 8am and 10am to Sunday School and Young at Heart. Groups meet from time to time to explore our Christian faith together. We are part of the Church of England, and our services range from traditional to informal. 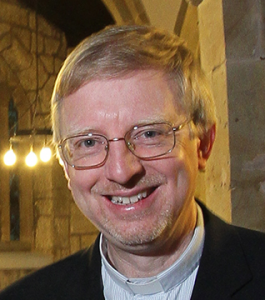 Revd Dr Andy Lord has been appointed as Priest-in-Charge of All Saint’s Didcot to start in September. There has been a church at All Saints’ in Lydalls Road, since the 12th century (at least) and we are very proud of this historic building which has been used to worship God for so many centuries. Take a virtual tour of All Saints’, Didcot. If you would like to know more about faith and what it means to be a Christian, various groups are held from time to time or it is possible to talk to someone about any questions you might have. Just contact us for further details. Our website has lots more information about all that goes on at All Saints’ but if you can’t find what you need, please contact us. You are very welcome to join us at Didcot All Saints Church. We have a variety of services and activities, ranging from Sunday services at 8am and 10am to Tiddlers and Toddlers and Young at Heart. Groups meet from time to time to explore our Christian faith together. We are part of the Church of England, and our services range from traditional to informal. We'll be having a special Mothering Sunday Family Communion at 10 am at All Saints Church on 31st March. To pop an envelope alongside/ inside your milk bottle lid bag. Please could you save from your incoming post the postage stamps (they need a 5mm boarder, to be eligible). Step it up by asking work/ school/ friends/ family to save to. These are being collected by 3 of our congregation for a charity, so bring them with you and pop them by the notice board to the left as you come in the door. Please if you can spare a little room in the kitchen or a bag on a coat hook, save these lids from your milk bottle tops. It is strictly these lids only. So please save us the task of sorting through. You will find at the back of the church (as you go in on the left), by a noticeboard where they can be placed. Make it a social thing and ask friends and family to join you in collecting. The lids are then weighed in and money given to the charity. In this case Thames Valley Air Ambulance. In this case every lid counts. Some photos from our church yesterday. If you were unsure what the new addition at the front is. Then here is a paragraph to explain. The Lent Tree is made from the stripped back trunk of our 2018 Christmas tree. This is a tradition which we picked up at All Saints Church 3 or 4 years ago but the tradition is much older than that (who can tell us more in the comments below?). Stripping back the tree reflects Jesus' experiences in the wilderness, which we mark in the season of Lent, when he gave up more or less everything except water and air for 40 days. To emphasise our own faith stripped bare, we place a verse of the bible on the tree at each Sunday service, with a set for Holy Week. We will have a fully decorated tree on Easter Sunday. This year our set of verses are written on cut out paper leaves which have been encapsulated in plastic. News on Mothering Sunday to follow soon. If you would like to volunteer to help out with Prayer Spaces at Northbourne School during the week of the 4 – 8 March, please use the sign-up sheet on the table by the door or speak to Tim.